Beyond its convenient, central location, the Metropolitan has its fair share of facilities to make your stay comfortable and stress-free. It starts with a transfer service from the airport (just book it ahead) and continues with a good choice of accommodation. There are superior rooms with all mod-cons, then, for a touch more space and luxury, deluxe rooms. Half a dozen junior suites add even more living space, whilst the single Deira suite is the pride of the hotel. 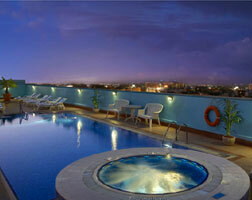 Up on the roof, you’ll find the cooling waters of the swimming pool and sun-deck. You can also get active in the fully-equipped gym or ease the day’s stresses in the sauna or Jacuzzi. For those who want to hit the beach, a twice-daily shuttle bus will speed you down to the Habtoor Grand Beach Resort and Spa where, for a small fee, you can enjoy both the pleasures of their pool and beach. The latter has activities such as waterskiing, windsurfing, jet-skiing and even scuba diving on offer. If you’re heading for Dubai’s massive retail experience, a complimentary shuttle bus service will get you to the main city centre shopping centres. Practically speaking, the Metropolitan has a Ladies hairdresser and a car rental desk where you can also book a memorable desert safari. For business types, the dedicated business centre provides you with essential tools such as photocopier, printer and, of course, internet access. The latter is also available in all the accommodation. 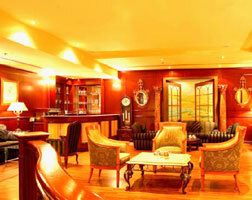 Meals and refreshments are taken care of in a choice of restaurants, a bar and the hotel’s elegant lounge. There’s excellent Chinese or international cuisine, or a pint in Dubai’s most famous Irish pub.